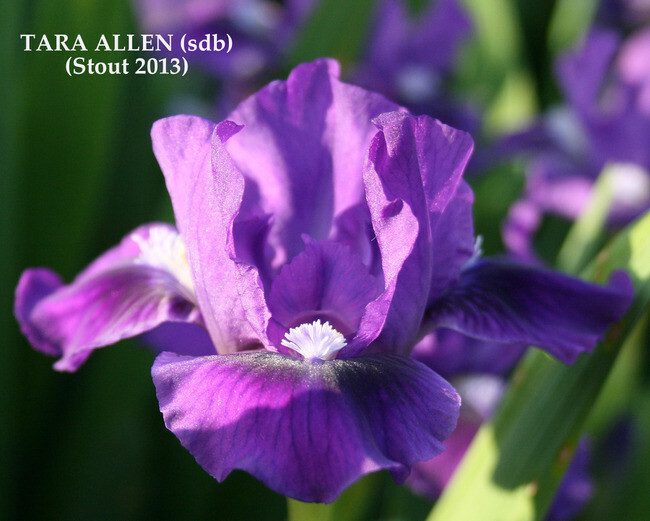 'Tara Allen' (Hugh Stout, R. 2013) Seedling# DX108B. SDB, 12 (30 cm), Midseason to late bloom. Standards and style arms medium orchid-purple; falls same, darker orchid around beard, darker veining spreading across falls, light ruffling; beards gold in throat, bright yellow-gold in middle, very light lavender end, hairs based lavender; pronounced sweet fragrance. 'Crystal Ship' X 'Neutron'. Stout Gardens 2013.